The Blue Dolphin hotel is of a high standard and is situated on the beach. There are many activities for children organised every day and evening entertainment is also available. The rooms have air-conditioning, fridge, TV and Wi-Fi internet access is also available. There are two swimming pools (one kid's pool) and there is also a bar. This was our first holiday without our children in over twenty years, and our first holiday booked independent of a travel company. Our room was on the ground floor and near to the back entrance of the hotel that led to the beach via a path through Olive trees. The room was well furnished and we had a lovely wicker patio set which included plump cushions to sit on.We had a very generous sized fridge in the room and a lovely big sink in the bathroom. The complex was beautifully maintained, with bouganvillia and palm trees and very green grass.We had a lovely walk to the dining room, not far at all, and the food was wonderful. Lots of Greek salads and stuffed vine leaves as well as a variety of meats, a very international based cuisine. Drinks were reasonably priced and the eating area was on a covered balcony where we watched the birds swooping down to the pool and the sunset in the evening. The staff spoke limited English but were pleasant and helpful. One particular Russian waiter was very polite and friendly, his English pretty good too! We hired a car and drove around Sithonia, discovering some fantastic beaches on our way! The hotel beach was a narrow stretch but perfect for swimming and exceptionally clear and clean. There is a small beach bar owned by the hotel where you can collect keys to sunbeds and parasol free of charge during your stay. There are showers and a toilet at the beach, and locals use the bar and picnic under the shade of the trees at the back of the beach.You need beach shoes on this beach as it is very stoney and rocky! The entertainment was fine, Greek singers and dancing but nothing elaborate. The bar and entertainment was open air but a pleasant way to spend an evening. Not much for teenagers or older children though! I would go back to this hotel but with friends maybe, we were one of three English families at the hotel! !Don't be put off though, we had a lovely holiday and have recommended the hotel to others! 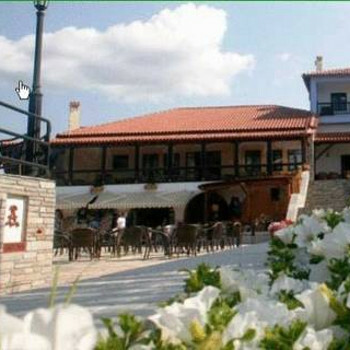 A great base to discover the glorious Halkidiki!